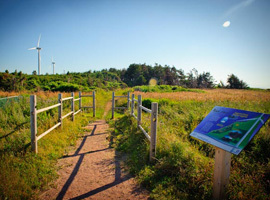 The Black Marsh Nature Trail is 5.5km return and is marked by twenty-five bilingual interpretive panels describing points of interest in more detail. 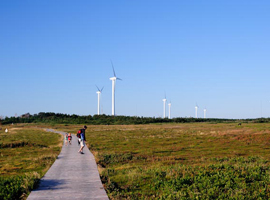 The trail winds through a wind-blown forest, along the red capes, and across a vast bog. You can walk under a giant whirring windmill, with a tower height of 80 metres and sense its great power. You will see seabirds, dragonflies, and butterflies and maybe catch a glimpse of an eagle soaring. 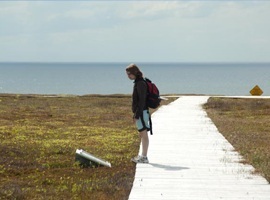 Walk slowly and look closely as you cross the bog boardwalk. There are tiny and uncommon plants in this area, including beautiful orchids and carnivorous plants. The ecology of the area is distinct and rugged, but most of all captivating. You will see Elephant Rock as it stands today and learn more about the geology that both created and destroyed this natural landmark. Check out the North Cape Lighthouse, important historically because it warned of the often hidden rock reef. Put on your hiking boots and grab your binoculars – there is something new around every bend.